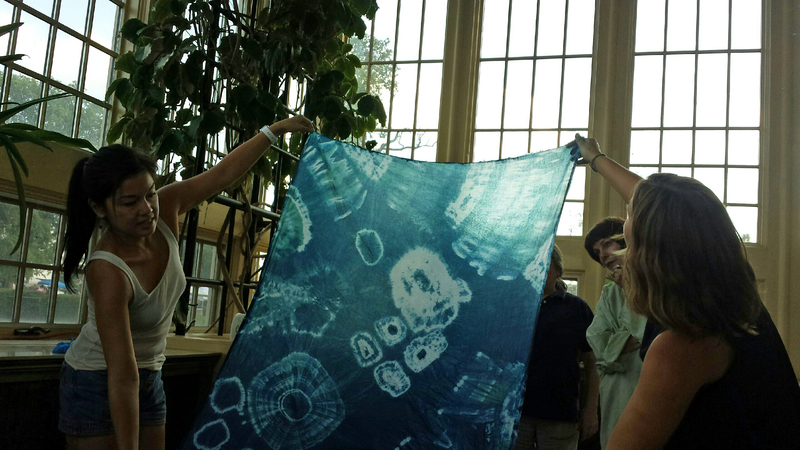 4 – 6 p.m. Join Wax and Wane fiber for this FREE hands-on natural dye class, and learn how to use green tea as dye, along with a technique called Eco-printing to make fabric art. Take your piece home or leave it in the care of the artists for possible inclusion in a curated show in October. Due to increasing popularity of these workshops, arriving at 4 is recommended, as space is limited. All ages welcome. Children must be accompanied by an adult. Eco-printing is a relatively new dye process that has been popularized by India Flint, an artist in Southern Australia. After discovering the beautiful after effects of steaming eucalyptus leaves on prepared fabrics, Flint delved further into this process of making. Instead of submerging the fabrics into a dye bath for color, we will make bundles of fabric and plant materials that get steamed, transferring chlorophyll and other pigments to the fabric. The products are truly one of a kind. You will learn methods that you can take home with you and use anytime the growing season is upon us!